A surging wave of British rock and pop acts washed all across Sweden as the Beatles led the frontline of the powerful British beat boom in Scandinavia during the early to mid sixties and onwards. 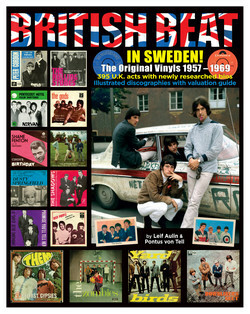 This book compiles in a most comprehensive way all 396 UK groups and artists having a record released in Sweden during 1957-1969, with either a single, EP or LP manufactured domestically for the Swedish market. Over 2.000 original vinyl releases are shown here in full colour! Most of them are here depicted in a book for the first time. Also shown are the numerous colour versions in existence of the often so beautifully made 45 r.p.m. picture sleeves. All the vinyl records (with variations) have been designated a valuation grade between 1 – 10 stars in order to guide you as to how rare and in-demand a certain vinyl is on the collector´s market today. 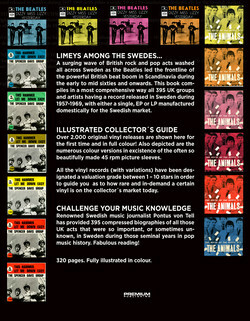 Renowned Swedish music journalist Pontus von Tell has provided 396 compressed biographies of all those UK acts that were so important, or sometimes unknown, in Sweden during those seminal years in pop music history. 320 pages. Fully illustrated in colour.